Seamless gutters have so many advantages over the old gutter systems, it's a wonder that anyone would use anything else. Seamless gutters offer the obvious advantage of no seams ! This means that you don't have to worry about water dripping between the seams anymore. California Gutterworks Inc. was formerly known as Armour Roofing. 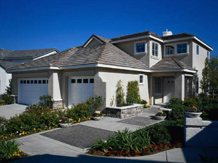 We have been providing service to the citizens of Northern California area since 2001. Our gutter technicians have over 16 years of experience in the roofing and gutter industry . Our company strives to provide quality products at affordable pricing. We are honored that you have taken time to visit our site. We would be happy to assist you with your gutter and leaf protection needs. Our seamless gutters come with a Lifetime Material Guarantee. These Seamless gutters come in a number of sizes and styles for you to choose from to fit the look and style of your home. We also offer a variety of modern gutter colors to choose from. These colors are baked onto the gutters on the inside and outside, This baked enamel paint system prevents the gutter paint from chipping, cracking or peeling (and rusting). This paint system is also guaranteed for a lifetime. Seamless gutters offer a wonderful way to give a clean and classic look to your home, while giving you ultimate water protection for many years to come ! Thanks for visiting our site. 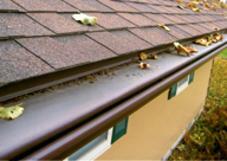 We install seamless gutters and downspouts as well as leaf protection systems for your home. Our gutter systems are fabricated by our seamless gutter machines - right at your doorstep ! Please take a look around. Let us know if we can help you. Get a FREE Estimate for rain gutter repair or replacement here! Get a FREE Estimate for leaf guard or leaf protection systems here! Gutter cleaning is a dangerous task! Stop cleaning and let our gutter protection systems do the work for you! 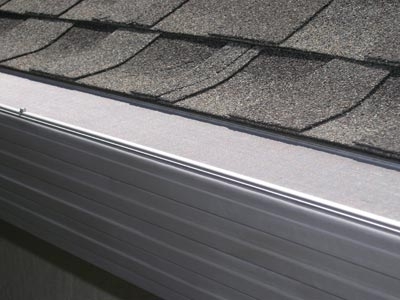 With today's most updated gutter guards, leaf protection can be made simple!